There are many takeaway from last week’s Election Day victories but one thing is certain: Democrats are back in a big way. We won because Democrats were united around our values, worked in partnership with groups across the country and elected diverse Democrats up and down the ballot. Georgia in particular had some big wins with three African-American mayors being selected in the cities of Milledgeville, Statesboro, and Cairo, GA.
Brendon M. Barber, Sr., a native of Georgetown, SC, has served on the City Council since 1998, and is also Mayor Pro Tempore. He is a 30-year plus employee of the Georgetown County School District. With both the Bachelor’s and Masters Degrees in Urban Development from Michigan State University, where he attended on a football scholarship, Barber will bring his knowledge of Urban planning to the table. He and his wife Pamela are parents of four adult children and six grandchildren. He is the brother of the Savannah Tribune publisher, Shirley B. James. He is now the first-ever African-American mayor of Georgetown. 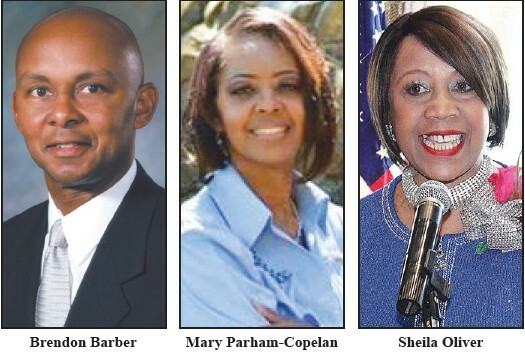 Mary Parham Copelan will become Milledgeville, Georgia’s, first female African-American mayor, beating incumbent Gary Thrower by just six votes. “I along with each one of you know that we needed real change and real progress for our city,” she wrote on Facebook following her victory. Jonathan McCollar will become the first African-American mayor of Statesboro, Georgia, defeating incumbent Jan Moore. Booker Gainor, 27, will become Cairo, Georgia’s, first African-American mayor. The victories that we celebrated last Tuesday would not have been possible without the massive support from the African-American men and women who made up about a fifth of the commonwealth’s electorate. As a cornerstone of our party, black voters set the tone for future elections, and paved the way for government that truly represents them. Here is just a small sample of the notable African-American Democratic victories: Justin Fairfax, VA: Virginia lieutenant governor-elect, second-ever African American elected to statewide office in Virginia; Sheila Oliver, NJ: Lt. Governor elect, New Jersey’s first African-American lieutenant governor; and Jennifer Carroll Foy, VA: House of Delegates 2nd district. Women are leading the resistance against President Trump, Vice President Pence, and Republican lawmakers across the country who are attacking women’s rights and working families like never before. Here is a small sample of the notable women Democratic victories: Vi Lyles, Charlotte, NC: Vi Lyles, first African-American female mayor elected in Charlotte; Deborah Gonzalez, GA: Flipped 117th House District; Erika Connors, NH: Flipped New Hampshire’s Hillsborough 15 district; Kelly Fowler, VA: Flipped House of Delegates 21st district; and Joyce Craig, NH: First female mayor elected in Manchester. For more info on the election visit DNC.org.